I first spotted Fuller Todd as the co-writer of some Marlon Grisham songs on Cover years ago. I wondered who was hiding behind this name since information on him was scarce and what his connection to Grisham was. Recently, I decided it was time to purchase his orginal records and began to research the story of Todd. Fuller Todd was born on March 26, 1935, in Holly Springs, Mississipi, to Maud Franklin and Mamie (Gardner) Todd. Todd came from the same region as Charlie Feathers, who was born three years earlier in Slayden near Holly Springs. Todd attended Central Millington High School and graduated from there 1953. Like fellow Mississipian Charlie Feathers, Todd eventually moved to Memphis and by ca. 1955, played in a band with Jody Chastain and Jerry Huffman. The band performed on local radio KWEM but by January 1956, both Chastain and Huffman had joined Charlie Feathers' band. Todd's career in music seems to have followed the path of Feathers' career astonishing closely. Feathers had recorded country singles at Sun Records before 1956 but was rejected as a rockabilly singer by Sam Phillips. Todd also auditioned at Sun but was turned down by Phillips, too. Todd, like Feathers, was then spotted by Louis Innis, King Records executive in Cincinnati, Ohio. Todd remembered his auditon for King vividly and was cited by Jon Hartley Fox in his book "King of the Queen City: The Story of King Records" as follows: "When I went there, there were about six or seven others besides me. So Louis Innis had me do my thing while he walked around the room listening. He came right up close, putting his ear against my mouth, just checking out my voice. I was the only one signed that day." While Feathers already made his first recording session for King in August 1956, Todd was eventually invited by King for a session in Nashville on March 25, 1957. 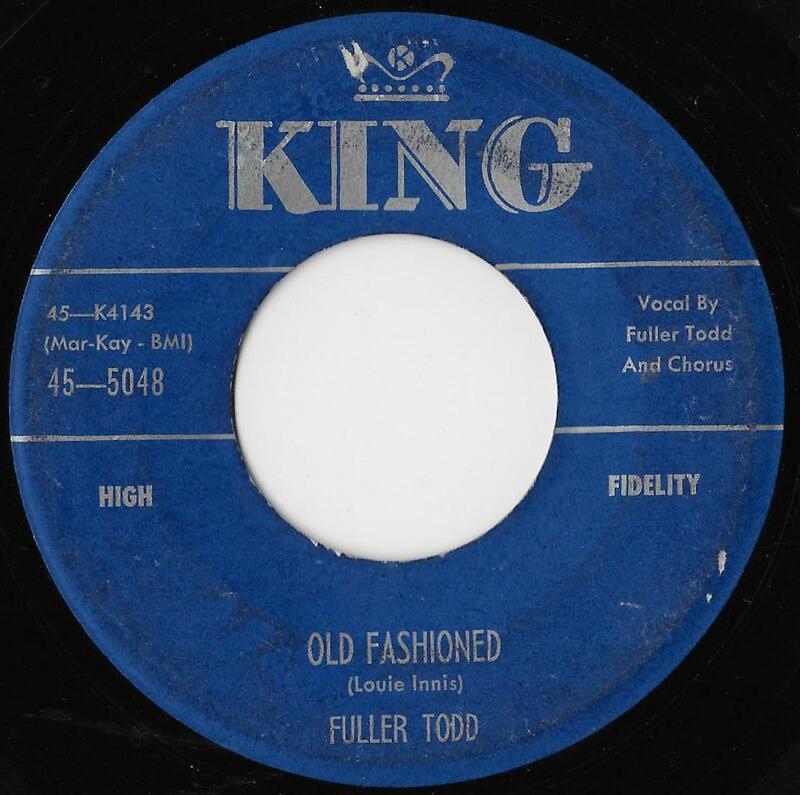 Four songs were cut that day and King chose "Proud Lady - Heart Stealer" / "Old Fashioned" for Todd's debut on the label, released ca. in April 1957 (King #5048). 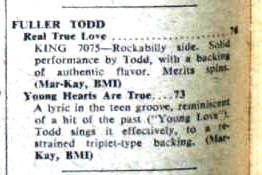 A rather strange release came into existence when King supplied Todd's recordings of "Young Hearts are True" and "Real True Love" for an Armed Forces Radio & Television 16 tracks LP that also contained songs by Brenda Lee, Carlson's Raiders, Eddie Fisher, and Perry Como. These LPs were intended for overseas usage to entertain the troops. A second session was arranged for Todd on January 12, 1958, this time at King's own recording studio on Brewester Avenue in Cincinnati. 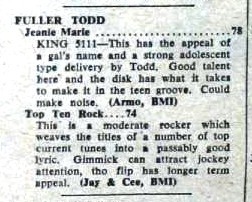 The product was the single "Top Ten Rock" b/w "Jeanie Marie" (King #5111). The latter was eventually covered by Trini Lopez, also on King. Left in the vaults from the second session were "Cuddle Up" and "You Baby." A good batch of the recorded song material was self-composed by Todd. 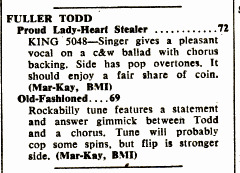 However, none of Todd's singles charted and King dropped him in 1958. Contrary to Feathers, who had shared Todd's fate so far, Todd did not pursue a career as a recording artist afterwards. He linked with another Memphis performer after that, Marlon Grisham, and wrote or co-wrote "Sugarfoot" and "Teenage Love" (both recorded by Grisham for Cover Records). He also penned a few songs with Jody Chastain, including "Dreamer" and "Tomorrow We'll Know" (the latter recorded by Ramon Maupin for Memphis in 1961). Besides, Todd composed several more songs, which are registered with BMI. Todd kept music as a hobby and held down a regular day job. He frequently appeared at the Strand Theater in Millington, Tennessee, with befriended musicians on Saturday nights for years. Fuller Todd died on July 16, 2015, at the age of 80 years. He was buried at Memphis Memorial Gardens.